A fruit dehydrator is a great investment for anyone who grows their own fruit in their garden, or even for someone who buys a lot of pre-dried and packaged fruit. These dried fruit products are needlessly expensive, and the one off payment of between $40 and $100 on your own dehydrator can save $100s per year not only on dried fruit, but dried meats (jerky) and dried vegetables too. The possibilities for fruit dehydrators are almost endless. You can dry the obvious choices: strawberries, grapes and bananas to be added to cereal, but you can also make unique snacks like fruit rolls (dried fruit puree, rolled up into a candy-like healthy treat) and apple crisps (slices of apple which go crispy when dried). Pineapple, papaya, kiwi, mango and watermelon are some exotic choices that make a fun and exciting change to the normal dried fruits. The reasons that people make dehydrated fruit are plenty. Firstly, they have a completely different taste to their fresh taste. They also make a healthy snack, as opposed to potato chips or candy for children. Thirdly, they store for months in zip lock bags, whereas fresh fruit goes moldy within days or weeks. Dehydrated fruits are very useful if you grow too much in your garden to eat while it’s still fresh. The best fruit dehydrator for you will need to suit your needs. For instance, if you have an allotment that grows a lot of fruit then you may want a commercial dehydrator with more than 5 trays. If you tend to be out of the house a lot, but would still like homemade dehydrated fruit then we recommend you find one with a timer, which will switch the device off after a certain length of time. Where does dehydrated fruit come from and how is it made? Chances are these things have never crossed your mind, because you’ve been buying your dried fruit straight from the grocery store, sealed in a zip lock bag and ready to eat. In fact, dehydrating fruits is incredibly easy, and costs half the amount it does to buy your dried fruit from the grocery store. These products have a huge mark-up price and your money is not paying for the cost of the fruit, or the drying process, but instead the packaging and the company’s profit. If you want to escape this corporate problem, or if you just have too much fresh fruit to eat before it starts to go moldy, then we highly recommend you learn how to dehydrate fruit. You can dehydrate any fruit at all, even watermelon, despite its very high water content. Another advantage to carrying out this process at home is that your home made dried fruits will not be covered in sweeteners and preservatives, and will be far more healthy for your teeth and body. Firstly you will need to wash your fruit, unless it requires peeling (as with bananas and citrus fruits). Remove any large pips and stalks, and slice thinly (or however thick you wish your dried fruits to be). If you’re making raisins, we recommend you use seedless grapes. From there you can place them straight onto your fruit dehydrator trays, turn the appliance on and leave it to do its work. Most fruits take around a day to dry, depending on how thickly they are sliced. Learning how to dehydrate fruits is very simple, and you can start right away once you have bought an electric dehydrator. These are perfect devices if you grow your own fruits and often find yourself with too many to eat at one time, as you can store dehydrated fruit for months. Apples:Peel, core and slice into 3/8-inch rings, or cut into 1/4-inch slices. Pretreat and dry 6-12 hours until pliable. Banana chips have been a popular sweet snack all over the world for a number of decades. There are, however, two problems with buying banana chips from the grocery store: 1. they’re expensive 2. they’re packed full of sugar and preservatives. Many people choose to make their own banana chips to free them from this problem (and the fact that some banana chips are very unhealthily deep-fried) and in fact, your banana chips don’t have to be sweet at all. You can use slices of plantain chips in your dehydrator and either eat on their own, or with a light sprinkling of salt for a yummy pre-dinner snack. If you are making normal banana chips you can leave them unsweetened, or dip them in honey for a natural sweetness that’s not so unhealthy. 1. Peel and slice your bananas into slices of around 6 mm each (1/4 of an inch). 2. Mix the lemon juice and water together in your bowl, and dip each banana slice into it. Once dipped, put each slice onto the surface of your dehydrator tray without overlapping. 3. Turn the dehydrator appliance on, at a medium temperature, and leave to dry for at least 8 hours. You may wish to turn them over half way through to ensure even drying. 4. Turn off the appliance once the banana chips have dried, and let them cool to room temperature. Serve or store in airtight containers or zip-lock bags. So now you know how to make banana chips, you can save money and save your teeth from all the excess sugar too. They also store very easily and will remain edible for up to 24 months. Use your dried banana chips and this banana chips recipe to top cakes, as an addition to muesli or just as a snack between meals. Dried banana chips taste great when mixed with nuts, seeds and raisins, and they provide a guilt free way to give your children a treat. Dehydrating apples is a simple process, but one that can have a number of outcomes depending on which way you carry it out. 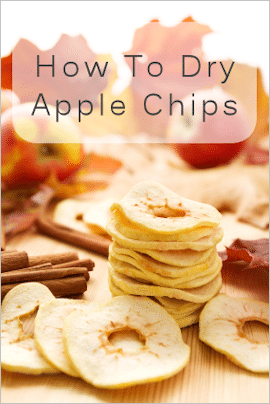 Using apple slices just a few millimeters smaller than the next could mean you have apple chips instead of dried apple rings, and you can use each type for different purposes. Dehydrating apples in a dehydrator is the easiest way to make these snacks, as it uses minimal electricity (around 35 cents per day for most models of dehydrator) and it does all the work for you. You don’t need to worry about losing solar heat when the sun goes down, or keeping the temperature constant in a homemade dehydrating cabinet, because the in-built thermostat does that for you. All you need to do is wash your apples, slice them as thinly or thickly as you like, treat them in solution and place them on the dehydrator tray. As you probably know, apples turn brown when they’re exposed to the air, but acid tends to counteract this reaction. Simply soak your slices in a mixture of 1 quart of water per cup of apple slices, and 1 tsp lemon or lime juice per quart. Alternatively, you can use ascorbic acid, but bear in mind that this is much stronger than lemon or lime juice, and you will need to follow the package instructions closely. The great thing about using a dehydrator to dehydrate apples is that you don’t have to choose the best tasting ones. If you find yourself with a particularly sharp harvest from your trees, or powdery ones, then you can dry them and they will still turn out delicious. Slice them very thinly to make crispy apple chips, or thicker for more chewy apple rings (these are ideal to give to weaned and teething toddlers to chew on). So the next time you find some apples at the bottom of your fruit bowl going wrinkly, don’t throw them away. Slice them up and put them in your dehydrator for a yummy snack that can then be stored for months on end in a zip lock bag. If you don’t know what fruit leathers are or how to make fruit leathers then don’t worry, you’ve probably seen them in the grocery store under the brand name ‘Fruit Roll Ups’. They’re marketed as a healthy treat made from dried fruit puree and juice, but the unfortunate reality is that most fruit leathers sold in stores are laden with sugar, preservatives and filled with little else in the way of actual fruit. This is no reason why you can’t enjoy your own healthy fruit leathers, though. Making your own versions means you can have complete control over what goes into your sweet treat, and in turn what goes into your family’s bodies. All you need is a food dehydrator, and the fruit roll up/fruit leather trays that are sold to fit them. You may be wondering just how to make fruit leather in a dehydrator. It’s a specific process, but not one that’s difficult or time consuming at all. You can use almost any fruit, as long as you can make it into a puree (so this excludes pomegranate and passion fruit). You might choose to leave the seeds in, or even add chopped nuts or other seeds to the mixture for some texture. Add a drop of food coloring to make it more appealing to kids, or swirl it through for aesthetic appeal. The choice is yours. Before you learn how to dehydrate fruit leathers you need to gather your ingredients. – 2 cups of fruit will make enough for one tray of fruit leather. Wash and peel your fruit if necessary. You can use frozen or canned fruit, but be sure to drain any excess water or syrup off. – Sugar. You can use any kind of sweetener you choose, from honey to molasses, or brown or white sugar. Use 1 tbsp sweetener for each cup of fruit. – If you’re using fruit that darkens in light or air (e.g. bananas, melon, apples) then add 1 tsp lemon or lime juice to every cup of fruit. Firstly, you need to turn your fruit into puree. You can do this however you like, but we advise against using a juicer as this leaves out all the thick goodness. A hand blender is best, as you don’t need to add any extra water for the device to work. Try not to water down your fruit, or it will be too thin to dry into a leather. Once your fruit is blended, stir in the sweetener and lemon/lime juice if required. Next, turn on your fruit dehydrator appliance and simply pour the puree onto your fruit leather tray to the thickness you want. The next stage in how to dehydrate fruit leather is the simplest: leave it to dry for 8 to 12 hours, roll up on a sheet of plastic wrap or greaseproof paper and serve, or alternatively store in zip lock bags to enjoy at a later date. Dehydrating fruits is one of best ways to eat and live healthy. 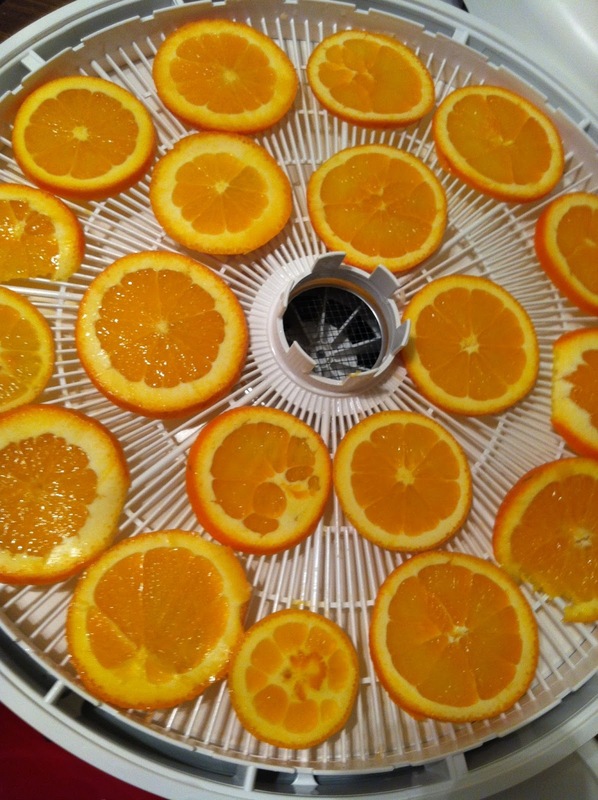 This can be easily done if you have an effective food dehydrator. You can store bunch of different fruits in your home without filling all the spaces inside your refrigerator. 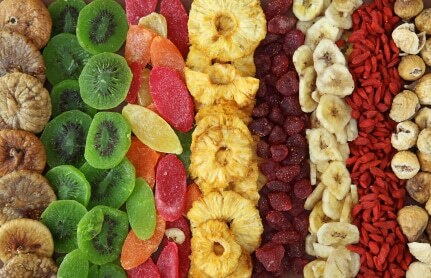 If you will dehydrate fruits, you can consume them longer. Plus, these can be great as snacks for you, for the whole family, and even for your friends. Instead eating junk foods, those dehydrated fruits are good alternative, especially while you are watching a movie in your home. Choose the best and the freshest fruits. If you will dehydrate overripe fruits, the results may not be good. Choose the type of fruits you want to dehydrate. These can be bananas, apples, strawberries, and many more. Prepare the fruits. You should wash them with water before slicing them. After that, slice the fruits evenly. You should be consistent with the thickness as you slice them. This is to provide even drying. There are fruits which are prone to oxidation. Like for instance, once you’ve sliced apples or pears, they become in brownish discoloration. This is because of oxidation. You can treat this with citrus juice or ascorbic acid. In this way, discoloration will be prevented. You can add salt, sugar, and other spices to each of them. This will add taste to the fruits after they are dehydrated. Prepare your food dehydrator. Make sure that it is well cleaned. Arrange the fruits into the tray. Make sure that the spaces between the fruits are equal. Lock the food dehydrator, making sure that everything is done appropriately according to your dehydrator’s manual. Follow the recommended heat and turn on your dehydrator. Some of them have a timer. In this case, it requires less monitoring. Some of them can dehydrate within hours while others, you have to wait for days. There should not be a present of moisture into the fruits. If there is moisture, the fruits still need to be dehydrated for few hours. To check this one, you may slice the fruits and look for moisture. After the fruits are completely dried, you may store them in an air tight container. If you have gotten your fruits from your garden, you should start dehydrating them while they are still fresh. Choose the best dehydrator that will perform all the work for you. You may read reviews in this site and pick up the one which meets your preferences and needs. Always remember that if you will store your dehydrated fruits properly, you can consume it for one year. A food dehydrator can also help you make fruit leather. You just have to choose the one with special fruit leather drying sheet or tray. You should arrange them in single layer so that the results are even. You can buy a recipe book that will help you prepare different menu with your dehydrated fruits. One of the best fruits which you can dehydrate is apples. They are delicious and nutritious even after they are hydrated. They are also great as snacks, particularly to kids. But one issue when dehydrating apples is that they tend to be darken when they are exposed to air. This is because of oxidation. That’s why a pre-treatment should be done before dehydrating them. Choose the freshest apples from the market. It will be great if you will get them from your own garden. In this way, you can be pretty sure that they don’t contain pesticides and other chemicals. However, you still need to wash the apples. This is to ensure that bacteria and other microorganisms are removed. You can peel the apples or not. It is up to you. Slice them evenly with consistent thickness. You can do the pre-treatment in two ways. First, you can steam the apples for 3 to 4 minutes. After that, wash them with cold water and remove the excess water from them before dehydrating. Second, you can soak them in lemon juice, pineapple juice, or ascorbic acid. In these ways, the apples’ color will remain before, during, and after they are dehydrated. Arrange the apples into the food dehydrator and turn on the dehydrator to its recommended time. It is great if your dehydrator has a timer because you don’t need to keep on checking it from time to time. But you have to check if the apples are completely dried. Moisture beads should no longer be present in those apples. If you can still notice some moisture beads, it means that you should dehydrate them for more hours. When they are completely dried, you can store them in an air tight container or jar. Lastly, you can now enjoy your dried apples. If you are going to buy this in the market, they are quiet expensive. That’s why it is more practical if you will dehydrate them in your home. If they are stored properly, you can have them for one year. Oranges are known to be great as juice because they are refreshing and they are good source of vitamin c. But they can also be dehydrated and can be added up to certain recipes as spices or flavouring. In fact they can also be used as potpourris. However, oranges may not be edible when dried. Choose the freshest oranges in the market. It is much better if you’ve gotten it from your own garden. Wash them properly to remove dirt and other bacteria. Slice them evenly with a sharp knife or blade. Arrange them properly into the food dehydrator and set the recommended temperature. There are food dehydrators that need to be rotated. That’s why you should rotate the tray from time to time. Usually the drying time is between 2 to 12 hours. Make sure that they are completely dried. When moisture is left within the oranges, molds will form. It is up to you whether to include the orange peels or discard them. The peels can be used as scents. You can do lots of things with your dehydrated oranges. They can also be added to teas so that there will be additional flavour. You just need to be creative and do little experiment with them. Have you tried eating banana chips? It is ideal as snack, especially for kids. They will surely love it. You can do it through food dehydration. You may own a food dehydrator. There are different types of bananas. Choose your favorite type among them. As much as possible choose the freshest. Peel the bananas. The color of the bananas will also change into brownish color. You can pre-treat them by soaking them into lemon juice, pineapple juice, or ascorbic acid. This ascorbic acid is available from the pharmacy in a powdered or tablet form. In this way, the bananas will retain their color. Slice them properly and consistently. After that, arrange them into the food dehydrator. Make sure that you will arrange them into single layer so that they will dry evenly. You can add adequate amount of sugar. In this way, the banana chips will become tastier and appealing for the kids. Turn the food dehydrator on and set it to its recommended temperature. Monitor it frequently if the food dehydrator does not have a timer. If your dehydrator needs to be rotated, then do so. This will give satisfying results. Once the time is up, you should check the bananas if they are truly dried. If you can still see that there are moisture beads, you need to dehydrate them again. Store them in an airtight container. You can enjoy eating them, especially when you are watching a movie or just relaxing at home. Banana chips can be expensive if you will buy it from the market. However, if you have a food dehydrator, you can make your own. You can even teach your kids how to do this.